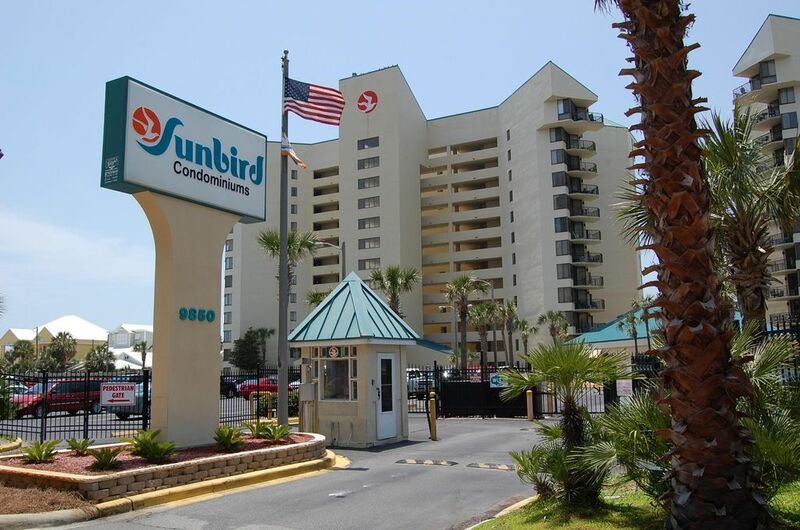 Sunbird Resort-Beautiful Gulf Front Condo at the Best Price/2 Free Beach Chairs! The SUNBIRD, Gulf-Front, one bedroom, one bath Condominium, sleeps four and is located at the popular SUNBIRD RESORT on Thomas Drive. The condo has many amenities including FREE 6 MEG WIRELESS INTERNET, Flat Screen cable TV, DVD, new fully equipped kitchen, private balcony overlooking the Gulf of Mexico, and queen-size bed. Our SUNBIRD Condo now includes Beach Chairs & Umbrella with your stay March 15th to October 15th! The SUNBIRD Resort has three pools (one heated), tennis, shuffleboard, racquetball, and jet-skis. The SUNBIRD is located next to World Famous Pineapple Willie's, and within walking distance of other great restaurants and recreational activities. Several golf courses are also nearby. See our prices below. We also have a great month to month rate in the winter. A cleaning fee per stay and tax applies. If you would like more information or to check prices and availability please contact me or check our calendar. Condominiums are available for your Vacation Year Round!! Paula & I bought our 1st Panama City Beach Condo way back in 1998. Having our own place on the beach was a life-long dream, & it has turned out to be one of the BEST things we've ever done. We have had hundreds of guests; many of whom we have become friends with over the years. They consider our 'Home Away From Home' their own & come back every year. We spend a lot of our time in Panama City Beach finding one of a kind items for our condo, enhancing the place with most beautiful view on the beach. Having a place in the middle of the 'World's Most Beautiful Beaches' is both unique & more fun than you can imagine! We chose Panama City Beach because of the combination of beautiful beach, & real 'Old Florida' charm. We love the great restaurants & beach bars, many within walking distance, & attractions to keep any visitor having fun. Right down the road is Pier Park where we spend a lot of time shopping & eating the great establishments. The Beautiful SUNBIRD Resort is the Best Place on the Beach! The World's Most Beautiful Beaches! Best Spot on the Beach! This was my 2nd stay at sunbird. I loved this unit that the Hundley’s own and hope to reserve it again in the near future. It’s very clean and comfortable. Also the unit has a spectacular view and is steps from the ocean. The umbrella and chairs was a plus! Thank you Hundley’s for a wonderful stay at PCB! My husband and I stay in this condo every year on our Anniversary and we love it everytime we stay. Everything is so clean and the view is amazing from the balcony and not to mention the bed we slept like babies the bed was so soft and cozy. We hope to get this condo again next year in August. Thanks! Don’t forget to call early for next year. This condo was perfect for our family of 3! The view was amazing! Thanks! Come back again soon! Clean and well stocked! Beach chairs wonderful bonus! Thank you!!! Wayne has a great condo with an excellent view of the beach and the middle pool. We had a wonderful stay. Our family all got together and we rented 4 great condos, 2 different units in each tower. Close to many great places to eat, lots of fun with many exciting things to do. Plus it is very close to the all important WalMart. We will be back. we loved the view! it was close to everything you could want, had a great pool and comfy bed. but condo was smaller than expected. the kitchen was so small only one person could be in it. to save money, we like to cook some meals at condo but it was difficult to maneuver sometimes. other than that, it was great! Neither the SUNBIRD or I rent to SINGLES under 25 years of age. The SUNBIRD requires a parking pass & arm bands for each guest purchased on arrival. Limit 1 vehicle.